The most versatile stroller! With 12 riding options, from infant to youth, your kids will love getting out and about. The Ready2Grow LX Click Connect Stand and Ride Stroller accepts TWO Graco SnugRide Click Connect Infant Car Seats, America's #1 selling infant car seats, has a standing platform and bench seat for your older child, and a removable Face Time rear seat for some bonding time with baby! Front seat, bench seat & standing platform each hold child up to 50lbs, rear seat holds up to 40lbs. Wash removable seat cushions in cold water on delicate cycle and line dry. Front seat, bench seat & standing platform holds child up to 50 lbs. Rear seat holds child up to 40lbs. The stroller is GREAT! It's very spacious and seems very comfortable to our toddler. It's much bigger than I expected. Barely fits in my car trunk BUT well worth it! An easy way to be mobile with two babies. After a lot of research, I'm so glad I made this purchase! It's perfect for my nine month-old and two year old children! I purchased it and it was very easy to put together and is very sturdy. The instructions were easy to understand and I was able to place the two snug ride in it, no problems. I have only gotten to use this once as my little one is only 2 weeks old, but so far it meets all my needs. My 18 month old loves to sit in the seat facing out. I love that my graco car seat snaps into the top for my newborn. So far its just what my family needed! It is wonderful to have the choices of how the kids sit however it is a pretty big and heavy stroller to lift in and out of the car. We have a 2016 GMC Acadia and need to keep half of the third row down to fit it in the back. The cup holder tray also is a bit awkward in being under the handle. The bottom basket is long but has a narrow opening and you need a thin diaper bag to squeeze in into the basket. Very nice, happy with it! One VERY SMALL issue. Really enjoy this stroller! I have an almost 3yo who thuroughly enjoys sitting in the front. (40lbs and tall at 37”) I have a newborn that sits in the back. 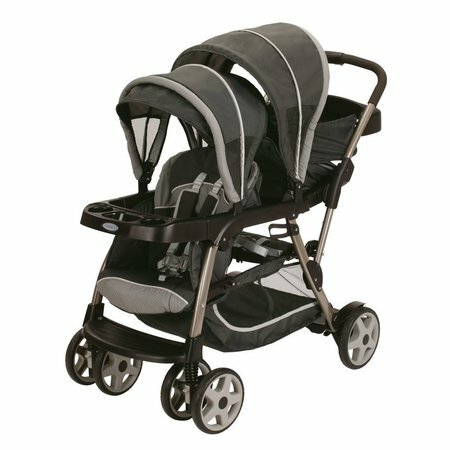 I only rated it a 4 out of 5 because our Graco Infant Snug ride 40 will not click in to the back. But for our uses it is okay! The other reviews talked about a small cupholder, which I can sympathize with. However, a large McDonalds cold drink fits snuggly, as do a regular water bottle. So I am not worried about that. I have a stroller organizer so I do not use my diaper bag in the center as much. But am happy to see there is room for toys and such for future park explorations! Excited for the spring to really get to utilize this stroller to the max! At 9mo pregnant I was able to set the stroller up on my own. I did need a philips head screwdriver for one section, but it was minor and not inconvenient. I was able to fold and unfold easily and was also able to find a nice place for storage in our very small house. It stands on it's own and is surprisingly easy to maneuver! It fits easily in my Jeep Commander and our Lincoln Navigator. It does not take up much more area than a single seat stroller, which my husband was truly surprised with. I did take the front cup holder/snack tray off but that was because my toddler was using it to climb up on the stroller. It snaps easily back in place, so will use a piece of velcro or small bungie cord to keep it together with the stroller when not in use. I am 5'3” and it fits me perfectly to manuever. My husband is 6'1” and does trip up a bit. However every single stroller we have purchased he has this issue. (Running stroller, single stroller, etc) Again, definitely not a dealbreaker for us! As with all plastic wheeled strollers, when trying to go over cracks in sidewalks more than 1/2” or similar rock sizes, it will stop suddenly. Not singled to just this stroller. Happens with all of them. I am able to push on the handle and lift the front (much to my toddler's enjoyment) to get over such obsticles or can walk around the front and lift it over easily. Truly excited to use it through the next few years! We haven't officially used the stroller as our newest addition hasn't arrived yet. We've already assembled and test drive it and it maneuvers nicely, sets up and collapses easily, and looks like it will be a great fit for our toddler and newborn. It's a heavy stroller and quite long, but we can for it in our midsize SUV's trunk. Looking forward to using this stroller for years to come. I've been using this stroller for about three weeks so far, and it has done good. Rolls good through grass & dirt. I still have yet to learn the removable seat.. The cup tray for us parents only has one; and can only fit a small sized cup. Not made for tall dad (handle). I bought this stroller about two months ago and love it. It is exactly what I needed for my 21 month old and newborn. The only thing I would change would be the weight of the stroller but was kinda expecting it to be heavy since it holds two children. So glad I bought this stroller for my 21month and month old. So many great options. Such a big basket compared to my single click connect stroller. I've been able to click connect my infant stroller and my toddler loves to climb in the front seat. Surprisingly does well over grass and unsteady ground. I never felt like it was going to tip. I wish the cup holders were deeper and wider or it offered a zip cubby for the adult. Heavy stroller and very long when collapsed for storage. Overall happy with my purchase. Is a car seat needed for newborn? looking to buy a conversion car seat instead of a carrier. 1. Yes, a newborn requires a car seat. 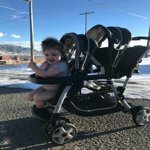 Does this stroller accept the SnugRide Click Connect 35 infant car seat? 1. Yes, this stroller is compatible with that car seat. Can the carseat fit both front and back of stroller? 1. Thank you for your interest in the Graco Ready2Grow Click Connect Stroller. The car seat can fit both in the front seat and the rear seat.